Salads are a great way to enhance health and an even better way to lose excess fat. The refreshing dose of fresh veggies in rich colors, lush green leafy treats and fruits can add a refreshing start to any odd person’s day. Top it up with a dash of extra virgin olive oil, you feel absolutely sure and certain that there is perhaps nothing that can come between you and a tiny waist. However, what a vast majority of salad lovers remain blissfully unaware of, is the fact that a gap still remains gaping when it comes to sufficient nutrition and this gap can be named as ‘proteins’. Protein is imperative for healthy weight loss and those indulging only in salads for the sake of urgent weight management may be at the risk of losing muscles than fat. This is a wastage that no one with even the slightest bit of enlightenment should bear the risk of. Protein packing your salad is not as difficult as it may sound. It is actually a blend of food compatibility with a little commonsense that does the trick. Here are 5 good ways to add protein to your salad for an effective yet tasty outcome. Adding Eggs – Eggs are one of the best sources of proteins that the world has woken up to. 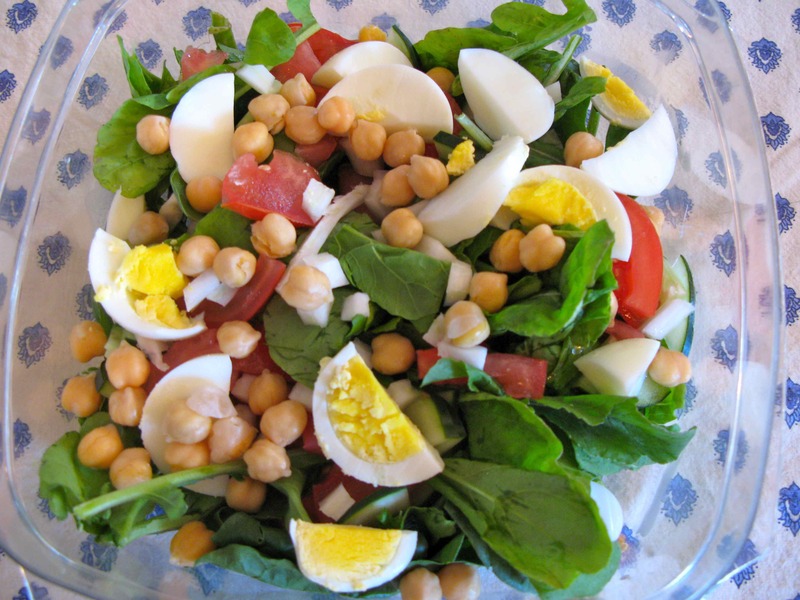 All you have to do to cut a hard-boiled egg into little chunks and throw it in your salad bowl. You can take 1 or 2 eggs depending upon how much protein your body needs. Adding Cheese, Cottage Cheese or Tofu – Cheese, cottage cheese and tofu are rich in proteins. Adding half a cup of the mentioned (or as required by body weight) to your salad should fulfill your protein requirements. These options are also great sources of other essential nutrients and minerals like calcium, vitamin D etc. Adding shredded chicken – Lean chicken can be crowned as the king of proteins. All you have to do here is roast the chicken with mild flavoring, shred it and throw it into your salad. With the greens that already exist in the bowl; this will become a complete food which will assist in perfect loss of fat while keeping your muscles intact. Adding Fish – When it comes to adding unadulterated protein to your salad, choosing from among a range of fishes like salmon, tuna, shrimps etc can serve your purpose with success. Roast it or grill it then cut it into bits and mix it with the green and colored veggies in your salad bowl for experiencing a low calorie yet high protein meal. Adding Quinoa – With the presence of 9 essential amino acids, quinoa is perhaps the best source of protein available easily at all times and in all places. Soak half a cupful of quinoa and add mix it with your salad for great taste, great texture and greatest dose of good health. As a word of caution, it is necessary to ensure not to overcook the options of proteins before adding them to your meal. This is mainly because overcooking can reduce the nutrient content of the mentioned foods.